So, for a while Brass finishes have been strictly reserved for 1980s faux-luxe window handles (think mahogany wood effect PVC) and Granny’s favourite chandelier, but it is truly having a resurgence into the world of cool, modern, eclectic interiors. At the moment, as in the photo above, it’s often seen in accessories pared with dark walls or furniture to provide a much needed warmth, and in many decorative accessories to add a glamorous, quirky, or unexpected metallic finish. In general, looking at up-to-date examples, I think words I’d associate with brass tones are luxurious, romantic, classic, sometimes industrial (if more of a shabby antique finish opposed to high-shine) and expensive. In our place, we do have brass finish handles and Yale lock parts on our front doors (we have an outer PVC front door, and an inner wooden front door) and back door in the dining room, but these have stayed mainly because we didn’t have the money to change the doors as they’re in fairly good nick, and didn’t want to be faffing about – and potentially breaking – the handle/lock mechanisms by changing them out – not even sure if this is a thing?! They’re not offensive, but I have purposefully chosen brushed or chrome silver finishes for all of the new fittings we have chosen, mainly in the kitchen and bathroom, as that fits better with the overall light, cool, contemporary style we’ve adopted. I do like the look of brass, but I’m not sure it’s for me. It seems somewhat bizarre to me to swap things over to a brass finish again, after always associating brass with the aforementioned, less than aspirational, dated, finishing touches. You might remember this beauty from my post about Black interiors a few weeks ago, but I am absolutely in love with it, so excuse me for using it again! It is just so pretty; I think the combination of traditional furniture and contemporary styling (wall colour, mirror and accessories) fits in the brass perfectly. Teal and brass is a classic colour combo to create a luxurious feeling space; here, mixed with the more mid-century furniture, it looks pretty cool. Using yellow on the soft furnishing softens the tone of all the different brass objects. I’m pretty much in love with this entire bedroom scheme. 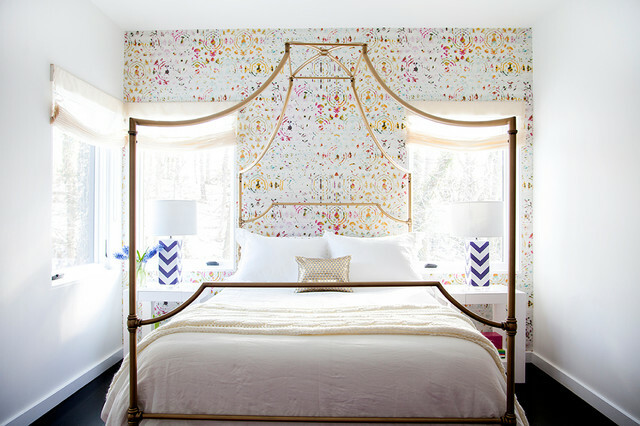 From the white walls, pretty wallpaper and romantic 4-poster, down to those chevron lamp bases (we all know I love a zigzag)! If you imagine this scheme with a silver or black bed, rather than the brass, it totally loses it’s warm, luxurious feeling. One of my favourite profiles I follow on Instagram. 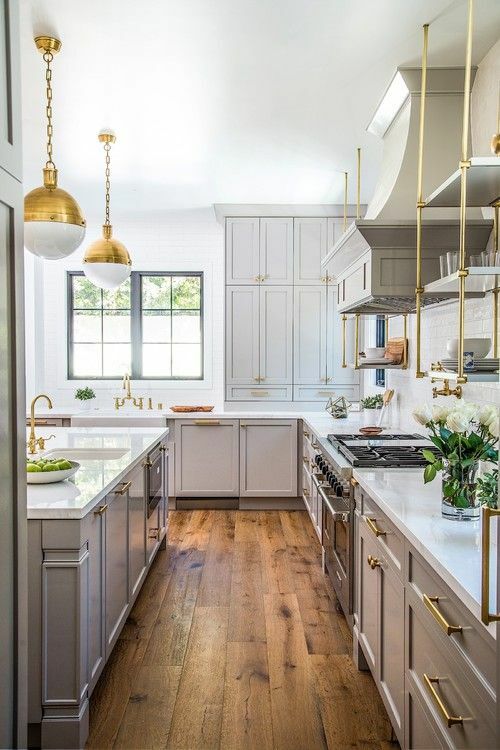 This kitchen is a dream. 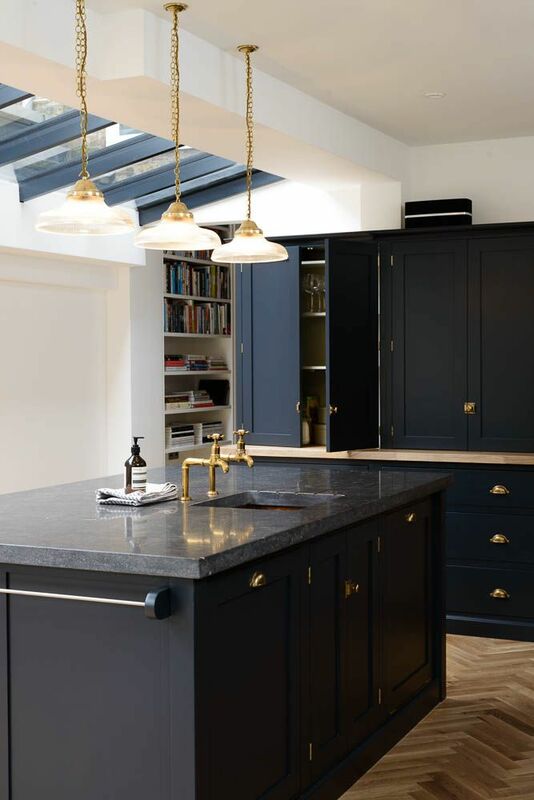 Here, she mixes the dark blue units with chunky brass handles to great effect; it looks classic but modern at the same time, and the rustic floor tiles add a whimsical flair that I love. 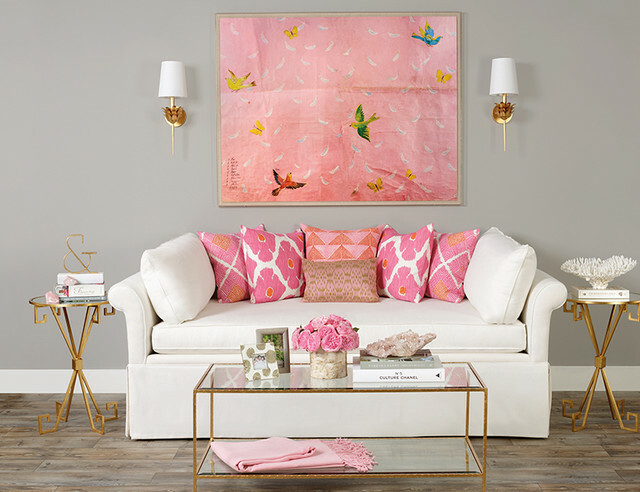 This is super on-trend, with the killer combination of pink and grey (with touches of green). The brass finish makes the furniture look even more ornate and glamorous in this pretty and feminine setting. Proving that brass works well with a light backdrop too. Here, it acts more as the accent colour, than finishing touch, highlighting the dove grey units beautifully. Those globe lights are stunning. However pretty, what all of this does show, is how quickly trends change, and how it’s best to just go for what you like, rather than what everyone else is doing – just think, for the last couple of years, it’s been copper everywhere and already, brass is kicking that particular trend to the kerb… It’s hard to keep up! If you’re in the market for new homewares, or planning to update a room, keeping your eyes peeled 24/7 is the key – you never know where inspiration will strike! This entry was posted in Inspiration and tagged bathrooms, brass, brassy, copper, daily prompt, dark interiors, DIY, finishing touches, home decor, Inspiration, interior design, interior trends, interiors, kitchen, luxurious, metallics, mid century, romantic, silver. Bookmark the permalink.